Alison Garnham and Susi Woodhouse present an evening of music and readings to celebrate Hans Keller. Alison Garnham and Susi Woodhouse present their new centenary biography of Hans Keller published by Routledge, in an evening of music and readings. A musician of penetrating insight, Keller was also an exceptional broadcaster, passionate teacher and compulsive writer, whose remarkable mind dominated British musical life for forty years after the second world war. 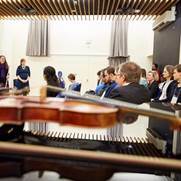 This event, the first of several marking the centenary of Keller’s birth, will look at the roots of his musical thought in Haydn’s string quartets, with illustrations performed by a student quartet from the Guildhall, where Keller taught after his retirement from the BBC. The event will be followed by an informal drinks reception.